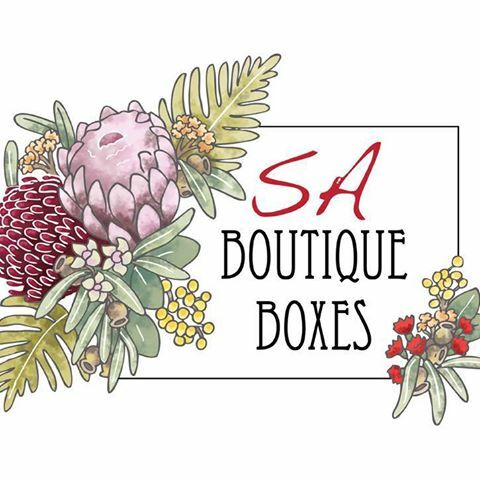 We specialise in boutique gift boxes that have SA only made and manufactured produce and gifts in them! We also make a range of SA bridal boxes, SA baby boxes and SA birthday boxes and SA brand new home boxes + more. We use Recycled & up-cycled materials for our packaging. We do things a bit differently than to other hamper and gifts places and don’t just stick anything in that box hoping you’ll like all of it (when you might like just 1 thing but need to buy the whole thing) and so we find out who the gift is for, what things they like and then we source SA products based on your giftee, ensuring they don’t get a gift they’ll never use. We have a list of trusted and professional suppliers who are willing to work with us to make SA great. We support stay at home mums, entrepreneurs, small boutique wine makers and many other small business manufacturers so we know the $$ will stay in SA! We have sourced some of the best recycled packaging and we just can’t wait to show you what we can offer you! We also offer a gift selection service! Can't think of a gift and want to support local small business? Contact us today and we can offer you a total packaged service, where we consult with you to find out who your gift is for, we source the gift and then we can wrap it and send it for you! All you have to do is sit back, relax and get that thankyou from the giftee! It's that simple! All packaged gifts have tracking and insurance on them and we also only use recycled or upcycled packaging and materials in all of our final products. We try to the best of our ability to source organic, carbon neutral and sustainable products. We believe in sustainability and caring for our environment.